They were so darn cute, but were they functional like wood birdhouses? Yes, because wool naturally sheds rain. You can provide a real nest site (and killer, unique gift) with these fun & functional wool birdhouses! Handcrafted from felted wool and hand-died yarns, they’re made with sustainably harvested materials including sheep wool, hemp and bamboo. 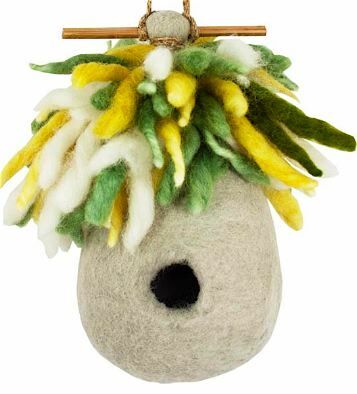 And, these fun hand-felted wool birdhouses are created by skilled, Fair Trade artisans in Katmandu, Nepal, supporting both urban and village women . If the surface gets wet it will easily air dry, they can be used indoors for a whimsical accent, or outside where birds can make a home to raise their young. Another really cool thing is that some birds will even snag the colorful fibers to build their own nests, and with the mild winter temps, nesting season is already upon us here in the Southeast. The 1.25-inch entrance will accommodate chickadees, titmice, wrens, and other small cavity dwelling songbirds. These amazingly cute birdhouses are designed for year-round outdoor use, and will maintain their shape for at least one year, with a longer life span if hung in a sheltered area. The bright colors may begin to fade if left in direct sun for more than two months. They’re a pretty generous size too, measuring 8.5 inches tall by 5.5 wide. 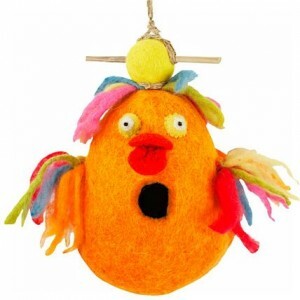 We can’t wait to hang one in our yard (they’re on their way now) and see who takes up residence, and see which birds enjoy feathering their nest with the bright yarns! For most of April and May, we’ve been giving away free nesting materials with all orders. Throughout most of the spring season, you can encourage birds to take up residence at your place with nesting materials. Different species build their nests accordingly, so we’ve used varied materials to make up the packages. 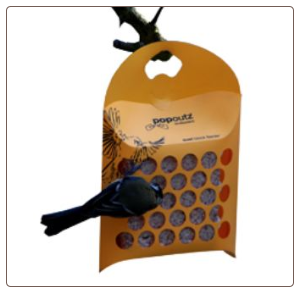 Shown here is a Pop-Outz suet feeder, and we’ve been giving them away too! The recycled plastic makes a perfect container for offering the nesting materials. Suet is always a welcomed treat for both resident and migratory birds and the Pop-Outz is a super fun way to serve it. No-melt suet or doughs are made specifically for warm weather feeding and the energy boost really helps out migratory birds after a long journey. But back to the nesting materials, ours were comprised of horse hair (from mane, tail and body), decorative mosses, like Spanish, sphagnum, and the yellow straw-like stuff, feathers and strips of aspen wood. Aspen fiber happens to be another favorite among North American birds, and is found in many of the commercial nesting material kits. A mesh produce ba g from the grocery store (like the kind apples come in) also works great for offering nesting materials, and we use them around our yard. Things like the Birdie Bell are also wonderful for nest materials, plus year-round feeding too. Entice birds to take up residence at your place by creating a suitable and friendly environment. Food, water and shelter are the basics, be it natural or man-made… the birds will thrive and flourish! With the hummingbird migration in full swing, it won’t be long before the tiny sprites are in your neck of the woods. Already spotted in LA, SC, TX and all along the Gulf Coast, its just a few short weeks before they’ll infiltrate up the East Coast and Midwest, ultimately reaching Alaska, British Columbia and Canada. 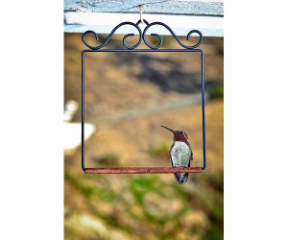 Aside from your hanging or window hummingbird feeder, you can further entice hummers with moving water such as birdbath fountains and bubblers, and of course, nesting material. 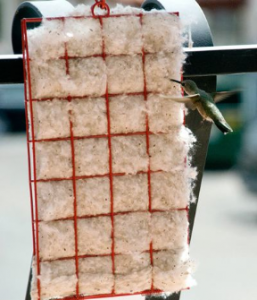 The Hummer Helper nesting material has been tested and proven to increase the numbers and activity of hummingbirds at your feeders. How you might ask? 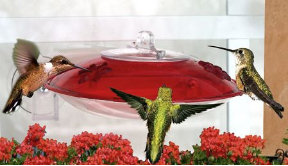 Because if suitable nest sites are found in your yard, juveniles will also visit feeders, including your window hummingbird feeder. If nectar is always kept fresh, and there’s an enticing water feature, you can bet the same hummingbirds will be back next year! They’re known to practice “site fidelity” meaning that attractive diggs will remain their site of choice the following year. 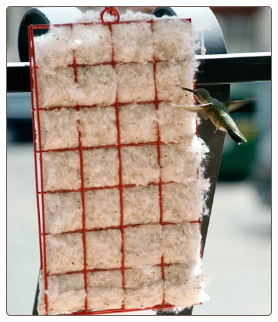 Hummer Helper Nesting Material has even been endorsed by The Hummingbird Society for its effectiveness at promoting nesting by hummingbirds. Hummingbirds aren’t the only ones who will use this nesting material either, American Goldfinches also adore the white fluffy stuff and will use it for their nesting season in late June through July. Encourage nesting in your yard through wildlife-friendly habitat. Food water and shelter are the keys, whether natural or man-made. Nectar-producing flowers provide food, while shrubs help with predator protection and provide nesting spots, these will attract many species of wild birds. Water is the best way to attract even more feathered friends too. Mature trees, fruit or berry-producing trees, and even brush piles serve many wild birds well. Never throw out or burn garden debris, if space allows, use it to create brush piles in the back of the yard… your wildlife will thank you for this valuable and natural cover! 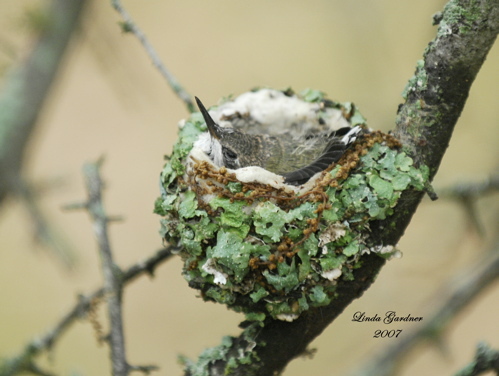 Encourage birds to nest in your yard by offering them a good variety of nesting materials. Simple things you may likely already have around your home are fantastic, items which birds will use for nest building. Got a pet? Cat and dog hair are some favorites, as are feathers, and decorative mosses. Spanish moss, sphagnum moss, raffia and aspen fiber are perfect nesting materials birds will go for! Brightly colored cotton yarns add to the mixture also helps grab their attention. One of the tricks is to have your nesting materials out before the nesting season begins, and in plain view where birds will easily see them. 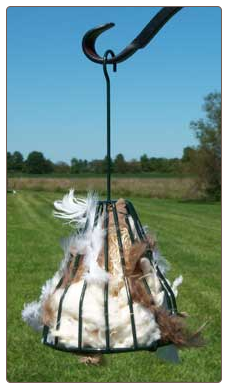 Lots of kits and fun holders are available for wild bird nesting materials. The Birdie Bell shown here actually does triple duty. 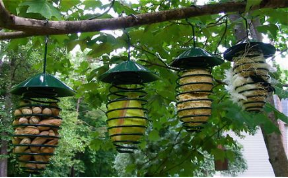 It will hold fruit in summer for the more exotic, migratory birds, and seed bells or suet in winter to help sustain your regular crew. Come spring, simply fill the bell with nesting material. An item like this with year round usage is a good value. 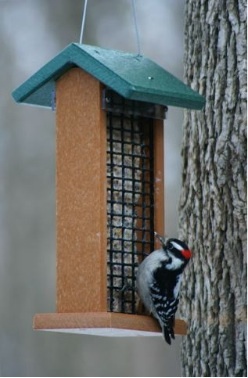 But truth be told… you can use a simple suet cage to offer nesting materials as well. 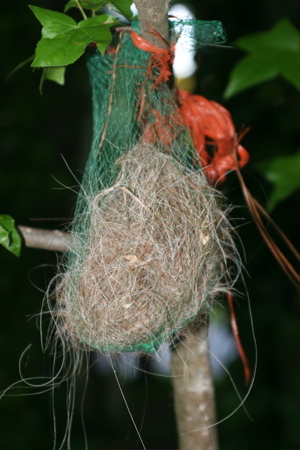 Even the mesh produce bags from the grocery store (like the kind apples come in) will effectively hold nesting materials that birds can access. So aside from the birdhouses and feeders, be sure there is a fresh water source too. Be it a creek or bird bath, all species of wild birds are drawn to water. 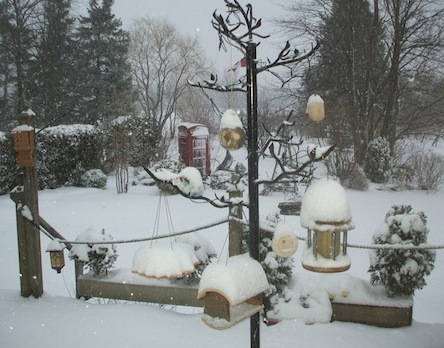 And don’t forget: start gathering materials now that will entice feathered friends to take up residence! Happy Birding!